Sierra Leone Freetown Young boys working as gravers on a giant cemetery in the outskirts of Freetown. Every day ambulances arrive with fatalities all packed in plastic and sprayed with chlorine. 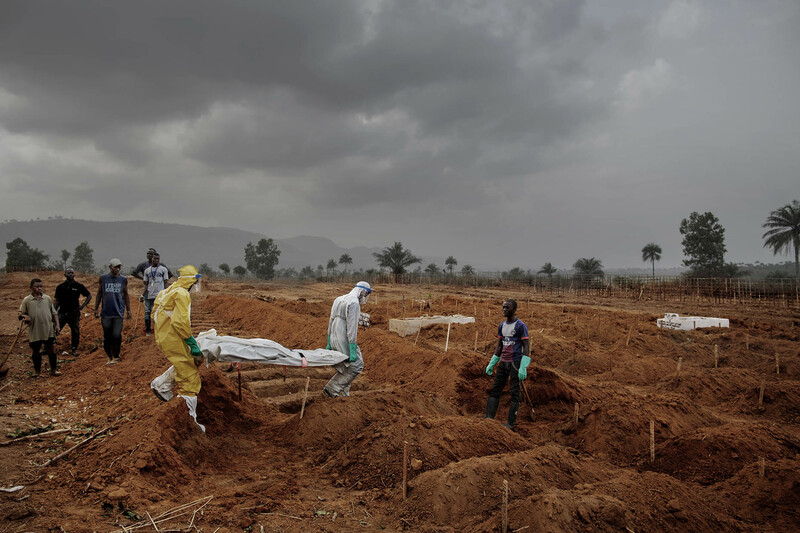 Not everyone who is buried died of Ebola, but all are treated as if they have it, to prevent infection. The young boys prepare 12 new graves without protection. The local heros in Sierra Leone have been fighting the Ebola-virus for a year now. Since the outbreak of Ebola in the country in May 2014, more than 100 health workers and 11 of the country's doctors (out of 120 doctors) have died. A total of approximately 3.500 people have died because of the Ebola-virus. The number of cases has been falling steadly, and the daily life is about to return to normal, with fewer restrictions on trade, border-crossing and gatherings.